Leftover crab is pretty hard to keep fresh for long. We almost always remove the crab meat from the shells and refrigerate it. One of my favorite ways to use leftover crab meat is a simple crab omelette that I not only eat for breakfast but also lunch or dinner! At its most basic, scramble up several eggs and cook with the crab meat and some salt and pepper. If you want to start getting a little fancy, you can add finely chopped tomatoes, some diced sautÃ©ed red peppers, sprigs of dill and other other appropriate herbs you happen to have in the fridge. I eat this omelette with rice and, of course, ketchup. Not sure why a lot of Filipinos have their eggs with ketchup but I like it as well. Other ways to used excess crab meat (particularly from steamed crabs) that are generally free of strong flavors such as chilli sauce, etc. is to make a crab spread. Add some mayonnaise flavored with some lemon juice, salt and pepper and chopped dill. This is great on small toasted slices of French or other bread as an appetizer. I suppose a variation of this crab spread could also be used as a sandwich filling. Add some thinly sliced cornichons for added flavor. If you have lots of leftover crab meat, which is almost NEVER the case in our household, you could make some crab cakes as well. i love crab omelette and i also eat it anytime of the day bfast, lunch & dinner. instead of ketchup, i like mine with brown sauce (oyster sauce & other seasonings) that my dad makes, just like the traditional sauce one finds in a chinese restaurant when you order crab fooyung. aside from omelette, we also use the crab meat to make corn & crabmeat soup. we make baked crab dip – with sour cream and lots of old bay. oh yum yum yum. 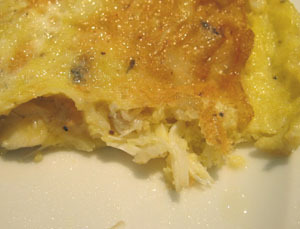 i LOVE crab omelet, but i do it “guisa” style first, then enclose in the eggs. tei’s suggestion sounds fabulous. It’s not only a Pinoy thing, this eggs w/ketchup. The Brits do that too (my boyfriend anyway) – he cannot have scrambled eggs or omelette without ketchup. hmmmm. . . also try sauteing the crab meat with shallots, garlic plus thin slices of leek and drops of sesame oil, yummy very oriental hehe. . . it also works in frittata. . . I started to cook about two years ago and love it. I long had a sneaking suspicion I would, wished I could learn from my mom’s cooks (she doesnt cook herself) but always found the kitchen too crowded. My first apt and its kitchen were too small for entertaining or comfortable cooking but I plunged once I got a bigger place. I’ve learned mostly from cookbooks, from a few half-day classes, a little TV and a lot of trial and error, all when I can get work out of the way. I’m cooking more and more and recognized the frustration you described in having to go to several stores to find all your ingredients. Not to mention that, until now, the stores I’ve gone to are supermarkets and delis. And it’s getting expensive. So bourgeois me (a word with many meanings, some seemingly contradictory, yet most of them negative) am about to take another plunge: I discovered your site when I googled for Makati markets. I love your site! Will be visiting whenever I can get work out of the way! the chinese (at least the locals) pair egg (in oyster cake) with catsup as well!